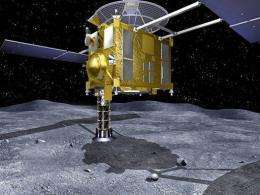 This artist's impression released by the Japan Aerospace Exploration Agency (JAXA) shows the space probe Hayabusa collecting samples from an asteroid. A tiny heatproof capsule which scientists hope contains some of the oldest dust in the universe will streak back to Earth and land in the Australian desert on June 13, ending a historic space mission. The Hayabusa craft left Earth in 2003 and reached the potato-shaped Itokawa asteroid two years later on a mission to collect samples which may hold clues to the origins of the solar system. As planned, the spacecraft itself burned up on re-entering the Earth's atmosphere, creating a bright fireball in the night sky, but before doing so it released a heatproof sample canister which returned to the ground with the aid of a parachute. JAXA said it had located the canister in the Woomera Protected Area, a restricted military zone in the South Australian desert, using a helicopter. The capsule came to Earth shortly before midnight local time (1430 GMT) and JAXA said it would begin the task of retrieving the canister on Monday afternoon. The round-bottomed capsule, which stands 20 centimetres (7.5 inches) tall and 40 centimetres in diameter, will be taken to the JAXA facility in Sagamihara, near Tokyo, for analysis by scientists from Japan, Australia and the United States. It is the first time a spacecraft has made contact with an asteroid and returned to Earth. Staff at the Sagamihara centre clapped and cheered after confirming radio signals from the capsule as it made its descent, Kyodo News agency reported. "We achieved this result based on technologies and science that have been built by our predecessors," JAXA's Hayabusa project leader Junichiro Kawaguchi said at a late-night news conference, Kyodo reported. Space fans from around Japan gathered at the JAXA centre to watch the capsule's return on video screens. The Hayabusa suffered a series of technical mishaps during its seven-year, five-billion-kilometre (three-billion-mile) space odyssey, leaving it limping home on limited power some three years late. And after a malfunction with a system designed to stir up dust while the craft was on the asteroid, scientists from JAXA are uncertain what, if anything, the sample canister will contain. Hayabusa -- which means falcon in Japanese -- failed to shoot a metal ball at the asteroid to collect rock samples, but Kyodo said JAXA officials believe sand may have entered the capsule as it landed. Hayabusa, designed to test the practicality of bringing back samples from celestial bodies, found that Itokawa was between "several tens of millions and hundreds of millions" years old, and had likely broken away from an ancient celestial body formed in the solar system's most primitive stages. Scientists hope to study any material Hayabusa has managed to collect to learn about how and when the asteroid was formed, its physical properties and how it has been affected by factors such as solar wind and cosmic radiation. To prevent any samples being contaminated by material from Earth, the capsule will remain sealed until it reaches JAXA's Sagamihara facility. The capsule will then be x-rayed and cleaned before being opened in a vacuum inside a special "clean chamber" unit. Itokawa is in orbit near Earth, was discovered in 1998 and is named after the late Japanese rocket scientist Hideo Itokawa. An international team of scientists gathered in Woomera to witness the craft's spectacular re-entry and recover the capsule. Local Aboriginal tribespeople were to assist in the recovery of the canister to ensure no damage is done to sites sacred to their ancient culture, which stretches back more than 40,000 years. Now wait. Oldest dust in the 'universe'? Very old dust in this solar system, old dust in this galaxy, ok. Universe? Define it.